1. Wind works by creating jobs. Currently the wind industry employs 85,000 people, including 18,500 in the manufacturing sector alone. According to a recent study from Navigant Consulting, a 25% national renewable electricity standard (RES) would result in some 274,000 renewable energy jobs. And there are 14,000 manufacturing jobs ready to come online once a strong, stable policy (such as an RES) is enacted. Many of the jobs that would be created would be located in areas that boast manufacturing expertise but may have been hard hit in recent years as jobs were moved offshore. 2. Wind works for America’s rural communities. 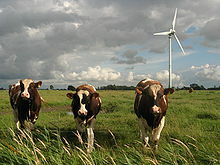 Wind farm development puts money in the pockets of America’s farmers via lease payments, allowing them to continue to farm their land while the wind turbines that they host harvest a new, inexhaustible kind of “crop.” A single wind turbine can provide $3,000-$7,000/year or more in farm income even though only 2-5% of the land within wind farm boundary is used for turbines and access roads. Wind farms also pump millions of dollars in tax revenue into rural communities. 3. Wind works for consumers. Wind is a free and renewable resource providing long-term stable energy prices for American families and protecting them when they need it the most: when fuel prices go up. A 2007 study by global energy consulting firm Wood MacKenzie on a 15% RES by 2020 found that electricity prices would decrease by 7%-11%. Wind power already protects consumers against the recent price volatility that has characterized natural gas. 4. Wind works because it is inexhaustible and reliable. Studies and reports continue to pile up confirming wind power as a reliable generation source. A study released by the National Renewable Energy Laboratory (NREL) earlier this year found that there are no fundamental technical barriers to reaching 30% wind in the Eastern Interconnection, which comprises 70% of the U.S. population. Another study funded by NREL found that wind-rich Nebraska and other states in the Southwest Power Pool region can reliably obtain 40% of their electricity from wind energy. Iowa generated over 14% of its electricity from wind in 2009. 5. Wind works by protecting the environment. The use of wind power reduces mining and drilling activity for fuel, hazardous waste (e.g., coal ash), and water use. And, of course, wind power avoids emissions that contribute to smog and still impose tremendous health and environmental costs. (The National Academy of Sciences has estimated that fossil fuels cost the U.S. $120 billion a year in health costs alone, including $62 billion from coal plants.) America’s current wind power fleet of 35,000 MW will avoid an estimated 62 million tons of carbon dioxide annually, equivalent to taking 10.5 million cars off the road. America’s wind turbines also conserve approximately 20 billion gallons of water annually. IS WIND POWER A REALITY? The question most Americans ask – is it really worth it for the average citizen? What are the drawbacks? One disadvantage is the lack of reliability of wind power. Simply put, the wind doesn’t always blow. But, maybe that’s not a problem if you have a very windy neighbor, or friend nearby! What always concerns me is the initial cost of the operation, which most folks cannot afford, and the life of a wind turbine. Most estimates give 20 years as the average lifespan of a turbine. Is wind power a reality or more of wishful thinking? Are small rooftop turbines going to proliferate the post-fossil era sky? I’ve made the decision to run for the Lawrence City Commission. This decision was based on my involvement in the community over the last four years. During that time, I have realized how much I enjoy working with others in the community who care as much about Lawrence as I do. Getting involved and at times leading efforts that impact the lives of others has been a great source of satisfaction for me. I am ready to apply my commitment and talents on the City Commission.